We have an extensive line of reproduction sampler charts … and many others. Check back here often for updates. We love fabrics. We carry linen, linen, and more linen, particularly for all the reproduction samplers we are so fond of stitching. While hand-dyed linens from Weeks Dye Works, Lakeside Linens and Picture This Plus, and linen from Zweigert and Permin make up the bulk of our fabrics, our inventory also includes samplings of aida cloth, tula, and klostern. You can link directly to Wichelt or Access Commodities to see colors and specifications for most of these fabrics. Visit our Fabrics page for more information. With an extensive selection of fibers for both needlepoint and cross-stitch, no stitch is left undone. 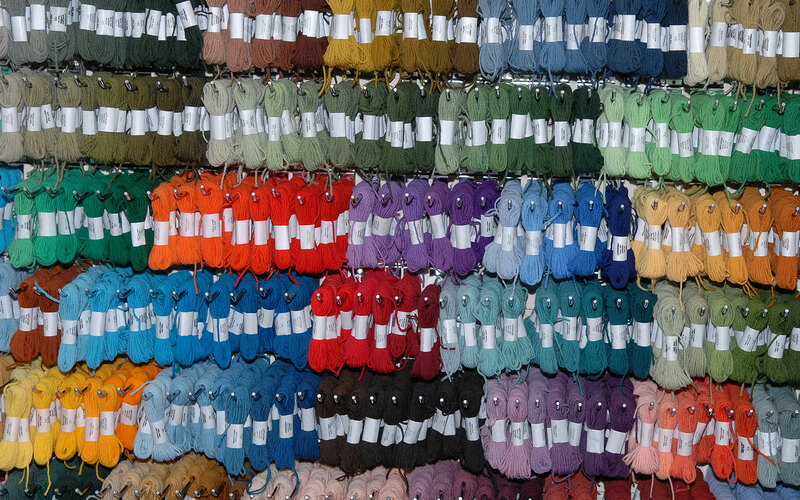 We generally carry complete lines of all threads, except Rainbow Gallery, of which we have a large assortment. We are happy to special order those fibers that we do not regularly stock. Watch our website for listings of these fiber companies and their website. Visit our Fibers page for up-to-date listings. Our needlepoint collection includes handpainted and preworked canvases as well as a variety of design kits. Our design inventory includes an extensive range of styles and accommodates all stitching levels. We are always happy to research and special order whatever you are looking for if it’s not currently in stock. Visit our Needlepoint page for a complete listing.